It’s not often that a property with a history dating back to the year 1330 comes onto the commercial market. The Grade II listed 74 & 75 High Street sits opposite Lewes Castle in the historic East Sussex town. It’s believed that the building was part of the “Inn” of the Steward of the Barony and Manor of Lewes before it became privately owned and then was used as a retail property. Ownership of 74 & 75 High Street, Lewes has been tracked back to 1542, with the building’s first commercial use being noted as a Haberdashery and “Slop Shop” (slops are working clothes). Later occupants include a butcher and for much of the 19th Century the premises were used as a bakery shop. 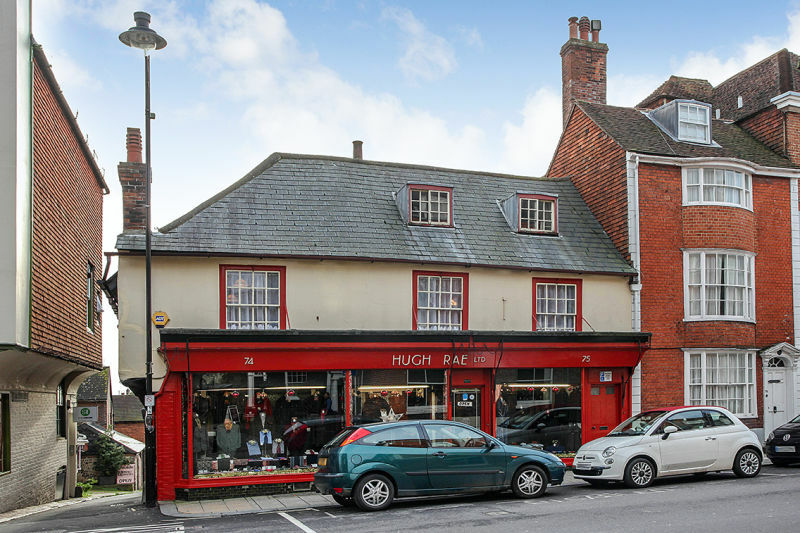 At the start of the 20th century the commercial property was converted to a tailor’s shop, and stayed in the same ownership of the independent menswear retailer Hugh Rae Ltd from 1923 until its recent sale. The history was outlined by Colin Brent for his book “Pre-Georgian Lewes” in 2004 and has been a useful accompanying note to assist Oakley Property in the sale of the building, ensuring its new owners are fully aware of its story and role in the Lewes community to date. Leigh Doherty of Oakley’s Commercial Property Head Office, was delighted to be involved in the sale of such an interesting building. Nestled among a diverse mixture of properties on the high street, with a good spread of independent businesses, the ground floor retail space of number 74 & 75 has a large shopfront for showcasing wares and the first and second floors have living accommodation including attic rooms; the building even benefits from its own small patio. The interior is currently a patchwork of style from decades gone by that tell a story of the last 94 years of ownership. What’s in store for the shopfront now is yet to be revealed; but with more than 2,000 square feet in the property it has so much potential for all kinds of retail businesses and its Grade II listing will see it sympathetically restored.